Which store in NI did you find these? I found some in Cheetham Hill this morning they had loads left hope this helps someone. Thanks for the reply.Might take a race out and get some. 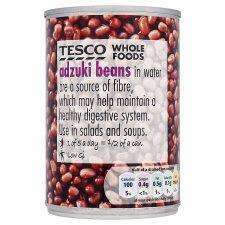 Great for red bean dessert! don't go there ESPECIALLY for that - to avoid disappointment... but if you go for general shopping don't forget to have a look at the canned vegs shelfs! what recipe do you recommend? Just heat them up and add cream or do you do anything more elaborate? My local wouldn't sell these to me, said they were too cheap and the price is wrong. I only had the one tin. How do these go down on toast? I hate when shop assistants use their brain like this. This is a great advertise for the shop, people go there for this and end up buying lots of other stuff. And it's NOT up for them to decide the price. They have self-help exits though! I would have gone back right away and bought the whole lot left - just out of principle. what recipe do you recommend? Just heat them up and add cream or do you … what recipe do you recommend? Just heat them up and add cream or do you do anything more elaborate? 1) No need for the soda. 2) I don't use peel as no one in the family likes the taste. 3) I add small tapioca too. Pak Hup is dried Lily bulb. Go to any good Chinese supermarket and they'll sell it. Got some from Hanley branch. Great for pate or beanburgers. Thanks. The offer had ended on Monday morning in the store I visited. It was back to 74p. Now scanning at 74p in Hanley.